It’s pizza night! I love pizza night because the options are limitless. Any topping your heat desires would be delicious. This is such a quick, easy, and fun dinner to make. Leftover pizza makes for the perfect lunch. I used a cutting board custom made from Trash Panda Workshop and I served my pizza on it as well. It’s absolutely beautiful! Trash Panda Workshop custom makes cutting boards. Check out their Instagram out at the link below! While the oven is preheating, slice the onion, green pepper, red pepper, and mushrooms. Set aside. Spray a baking sheet with cooking spray and place the flat bread pizza on the sheet. Spread about 3 spoonfuls of tomato sauce and spread evenly on the flat bread. Sprinkle a little bit of mozzarella cheese. Add half of the onion, green pepper, and mushrooms. Add the remaining toppings and more mozzarella cheese. Place in oven at 400 degrees F for about 15 minutes. You can add whatever toppings you want! This varies from meat to other veggies. You can even just make a plain cheese pizza! 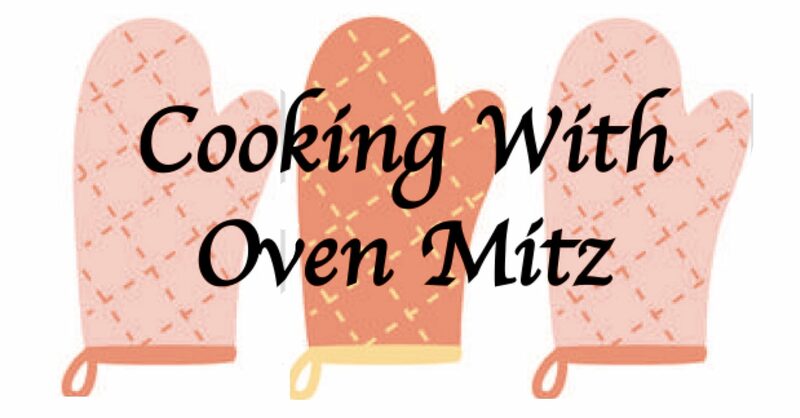 Tag me on Instagram, @cookingwithovenmitz, if you make it. I would love to see your version of it. Click follow and hit the like button to keep updated on new recipes! Hi everyone! I hope everyone had a fun-filled 4th of July! Today, I will be sharing my recipe on Baked Alfredo Pasta using Aroma Housewares Dutch Oven. This is a great recipe because you can cook everything in one pot and is perfect for a large group or great for leftovers. It’s very simple and all you need are a few ingredients plus whatever protein you want mixed in! Let’s get started! Fill the large Aroma Housewares Dutch Oven with water. Bring to boil. Add the penne pasta and turn the heat to medium-high. Let the pasta cook until al-dente; about 15 minutes. While the pasta is cooking, finely chop the garlic, onion, mushrooms, and spinach. In a large skillet, sauté the vegetables and add half a tablespoon of each of the seasonings. The onions should be translucent, the mushrooms should be soft, and the spinach should be wilted. Once the pasta is cooked to al dente, pour the water out and place the Aroma Housewares Dutch Oven back on the stove. Preheat the oven to 385 degrees F.
Add about 1/2 a cup of skim ricotta cheese to the pasta and 1/4 cup of mozzarella cheese. Add about 1 cup of alfredo sauce and stir to coat the pasta. Add the sautéed vegetables to the Aroma Housewares Dutch Oven and add more seasoning to taste. Layer the top coat with mozzarella cheese and then a thin layer of bread crumbs. Bake the pasta at 385 degrees F for about 40 minutes and then broil on high for 5 minutes. I absolutely loved using this Dutch Oven from Aroma Housewares! It’s so versatile and easy especially when you can cook everything in one pot. Whether you want to Stew, Bake or Slow Cook, the DoveWare Dutch Oven will not disappoint. With its classic design and versatile usage, you can cook your favorite dishes to perfection almost anywhere. Feel like traditional stew on an open flame? A quick meal in the microwave? Or something completely different? The possibilities are endless! Their products, both sensible and unique, continually improve the kitchen experiences for cooks of all skill levels. They are the top of the line, and with simplicity and elegance Aroma’s products offer a great time cooking to anyone who uses them. The high standard performance of our cookware is guaranteed to remain over time while still providing delicious results use after use. Check out their pages below! You can add whatever you want in the pasta! Chicken, turkey, the possibilities are endless! Of course, you can even use tomato sauce, but I personally liked alfredo better. Baked pasta is one of my favorite go to recipes if I’m ever craving pasta. The top layer becomes crunchy yet the bottom later is delicious and creamy. Yummy!